Risk monitoring should be ongoing and continual. As you travel through the project lifecycle you should be monitoring for changes in the environment and regularly recheck your assumptions. The likelihood and impact of risks changes over time. Early on in the project the likelihood of risks occurring is much greater due to the relative uncertainty compared to the end of a project. 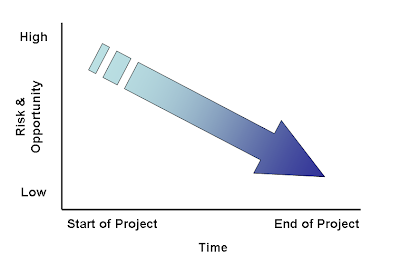 Also the impact of risks changes over time; for example if you cancel s project at the beginning you have expended less labour costs that at the end. 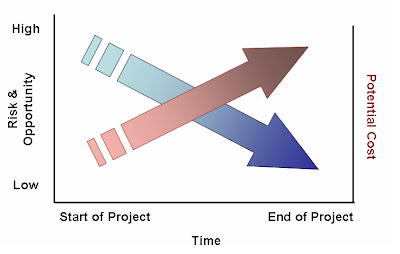 A project’s success factors change over time also. For example a building development may acquire a success factor of dealing successfully with local anti-development protestors. The risks associated with dealing with these stakeholders will change as their importance and influence changes. As well as monitoring existing risks you will have the opportunity to monitor for new risks. Have new opportunities for risk come up as a result of changing environment or scope? Has the project’s business case or relationship with the rest of the world changed? Risk Owners: Ensure all risks have an owner, even if there is no active management plan for them. It is best if these risk owners will have to deal with the results of the risk occurring to give them motivation to pay attention. Risk Meetings: Have formal risk review meetings where people have time to stop and think about risks. Time may cost money but often risks can be much more expensive that they first appear. You can also schedule low likelihood and impact risks to future dates. Triggers: Identify triggers for reviewing risks. If a risk is minor today but will become important if something occurs, look out for the something.